Last night still feels like a dream finally come true. I cannot believe that after over a year and a half of anticipation I finally saw Marvel’s Black Panther, and it did not disappoint. This film takes place after the unfortunate death of King T’Chaka (John Kani), which we saw in Civil War. Now T’Challa (Chadwick Boseman) must take over and become the new King of Wakanda. With his new title, T’Challa must learn how to rule while also dealing with the sins of his father’s past when a new villain threatens the future of Wakanda. What makes Black Panther a cultural superhero phenomenon is not only its predominately African-American cast but its choice to put multiple strong African-American female characters in the forefront of its film. You have Shuri (Letitia Wright) who is T-Challa’s 16-year-old sister and the world’s brightest mind when it comes to technology. Nakia (Lupita Nyong’o) is close to T-Challa but wants to go out into the world to help those in need even when her own life is put at risk to do so. Okoye (Danai Gurira) is the general of the king’s all-female guard called the Dora Milaje, and her loyalty to Wakanda along with her battle skills makes her character entertaining to watch. Never before have I seen so many strong African-American female characters with diverse backgrounds in a superhero film and I hope I will see more of it. 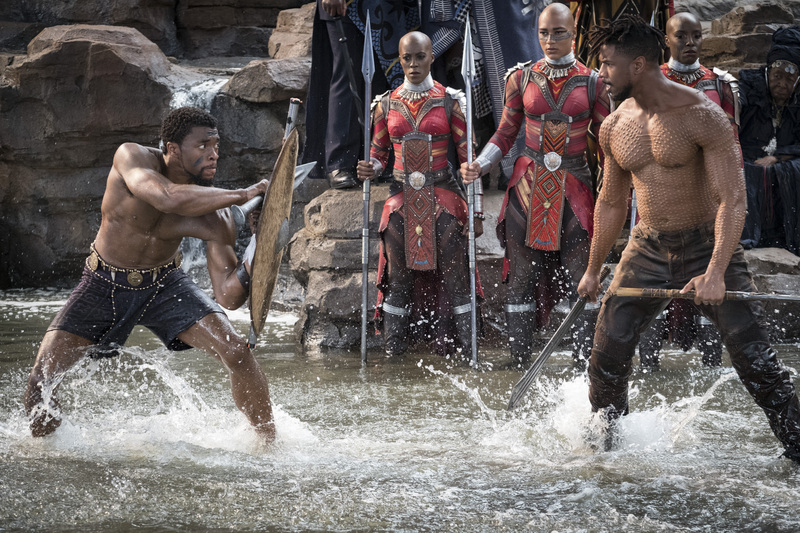 Black Panther is in a league of its own when it comes to the MCU universe. While the movie is very much connected to the events of the last MCU films, this movie marches to its own beat. The film feels like its own due to its impressive storyline and strong character development. It’s villain Erik Killmonger (Michael B. Jordan) also sets this movie apart from its MCU predecessors. During the film, I felt conflicted with his character because his motivations for why he becomes the villain of the film almost seem just. You empathize with his character and agree with his reasoning, but you know his approach is not heroic. I also loved Andy Serkis performance as Ulysses Kalue in this film. While many of us never truly get to see him in his human form, you can truly tell he had a blast with this role. Black Panther was an entertaining and enlightening film to watch. This film delivers on all levels from the amazing costumes and set pieces all the way to it amazing characters. After seeing this film, I am even more excited to see what Wakanda has in store for us with the May 4th release of Avengers: Infinity War. This film is one of the best MCU origins films I have seen and easily fits into my MCU Top 5 list. I would have to recommend you PAY to see this film in theaters. Black Panther hits theaters Thursday, February 15th. Click here to purchase your tickets now at Fandango so you don’t get sold out. Have you seen Black Panther? Share your thoughts on the film in the comment section below. Make sure to follow me on YouTube to check out my video movie reviews! Excellent review Sharronda I loved the movie!!! Black Panther was truly amazing!! It was awesome seeing African-Americans, especially the women in the strong roles of the Dora Milaje. It’s honestly amazing to see as typically African-American women are not cast in powerful roles such as these and you feel every blow dealt by them!!!! Can’t wait to see it again tonight and again Saturday in Dolby Cinema!! Seeing it for a second time this weekend. The best Marvel movie thus far. Danai Gurira was my favorite out of the cast. Great review! Can’t wait to see it again!! It Sounds like something i should pay to see. Cant wait! Marvel Black Panther was rich in storyline, character development, acting, and casting. It’s beauty in dialogue made stay in the moment. The technology and clothing in this movie was breathtakingly beautiful. Please don’t leave the theater, watch Marvel Black Panther to the very end. I am seeing this movie three times. Please pay this beautiful movie ladies and gentlemen. I give this movie an A. It was an amazing movie, definitely going to pay to see it again! Black Panther was amazing from beginning to end! I’m seeing it again this weekend. Definitely worth paying to see! Your review and this movie is awesome. In some ways the movie kinda of reminded me of the Lion King, and the conflict/jealousy between Scar and Mufasa. I really enjoyed the film. It had beautiful cinematography and I liked the fact that it had comedic elements at certain moments. I was not disappointed and I want to go see it again in either 3D or IMAX. I also wanted to add that the storyline was well written. Even though Michael B Jordan’s character was the antagonist some of his lines made him likable. It was also cool seeing a strong female warrior presence. Loved the movie. Will definitely see it again. The film made reference to many pertinent elements that’s relevant today. I must say after watching this movie finally, it gave me life. You did an amazing job with your review . I am beyond excited about seeing the movie again and sharing it with my daughter because I feel like she must see it. This was a great movie. Very accurate review. Enjoy watching you le reviews and look forward to them in the future. Enjoyed the movie and the portrayal of the African American characters. The costumes were phenomenal and let’s face it, lots of #blackgirlmagic and #blackboy joy all around. Lawd, there was some fine men. However, I can’t say it was the best Marvel movie ever. Was it good? Yes. Was is GRRREAT? Eh… I look forward to seeing more movies like this and hopefully this will elevate the platform for African American films. Worth paying to see though! THE BEST MARVEL FILM. NOT UP FOR DEBATE! This movie was beautiful. There are so many layers to it, but I loved how females protected their king. I love how T’Challa allowed himself to be human. Love for country. Loyalty and fulfilling your passion. This movie lived up to the hype and did not disappoint! Totally on point with your review! This was a great movie, seen it twice already and may go again because every time I see it I catch something I missed in the previous viewing. I definitely recommend it because it infuses pride, symbolism, action, and comedy in one movie. This movie was a refreshing addition to the superhero genre. I’m on hope that it will inspire more Black superhero movies. I paid to see it and it was worth every penny. I sae it three times. Amazing movie. Phenominal. I am soo proud and glad I saw thius movie in my lifetime. 5 stars. Eakanda 4 Eva! I can’t wait to see this! Thanks for the review. This movie was beyond amazing. Definitely a must see. Going to see it again sometime this week. Amazing film on every level! Great review! Thanks. I can’t wait to view this movie. Seeing a movie that depict Africans in such a positive light is well worth the money. Wakanda forever!!! I totally agree with your review..i enjoyed the movie to the Max.great movie..great acting! It has been quite a while since I have seen such a moving film. I appreciate the eloquent epic, all the efforts and captivating cinematography that resulted in a grand work of art. Thanks for keeping us updated on the movie and for your review. Fantastic movie. Visually, the movie was stunning. Killmonger was a great character. I was conflicted in wanting to see him lose seeing that I could understand his anger and wanting to see the world change. I was equally upset that King T’Chaka tried to call T’Challa home which would have allowed wakanda to be subjected to an angry dictator. Wakanda deserves T’Challa as a ruller. I wonder if Killmonger hadn’t challenged the throne and provided his perspectives, if T’Challa would have shared Wakanda’s knowledge and resources with the world. I’ve seen this movie twice already! Can’t wait to own it. The movie was fantastic!! Can’t wait to see Shuri become the black panther down the line!! I love this movie! I love all the powerful female figures. Definitely a pay. Loved T’challa sister. Her spirit was amazing in the film. I think the animosity between Black Panther and Killmonger does shed some light on Africans and African American relations today. Killmonger death and what he says struck home. This review makes me all the more anxious to see Black Panther. You did an amazing job on laying out the characters! I agree that it appears that this movie is in a league of it’s own. Although I missed the pre-screening, I’m most definitely paying to see it…soon! Black Panther was such a mind blowing movie that I know Im going to have to see it at least 2 more times to catch everything! You review was very much in line with how… it definitely delivered! This movie was excellent! It was beyond what I expected. There were so many messages in this movie! I will definitely see it again! I enjoyed the review even more since I’ve seen the movie. This review made me want to see it even more! Thank you! Movie was so goood!!! I gotta see it again. You don’t have to be a comic book fan to relate with this movie. It was absolutely wonderful. So many relevant lessons throughout. A must-see-again movie! Wow! Wow! Wow! Excellent review and excellent movie …. can’t wait until the next review. Great review! I look forward to seeing the movie again. Nice Review! I enjoyed the film for what it was. The production design and acting was spot on, but I definitely think the writing and editing could’ve been a lot stronger; especially given the amount of talent in the cast.